You might know that Doepfer can also do customizing and special design jobs for their clients (see HERE), but they must have looked up strange when they got a telephone-call from Dusseldorf in the late 80's.. It was Florian Schneider from Kraftwerk, calling if Doepfer could help them out retrofitting a miniature keyboard with MIDI. 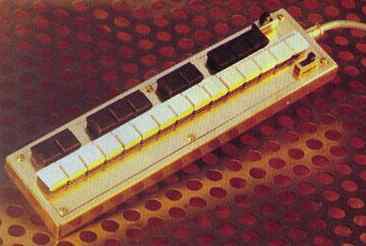 Florian would use this keyboard later to trigger a sampler, and used it with Kraftwerk live for the Pocket Calculator song. Schneider had to come back a few times to München for this project, and that is when the good relations started between Doepfer and Kraftwerk. From that time on they worked together on various projects like the MAQ 16/3 sequencer, the MOGLI, the A-100 vocoder and some others.